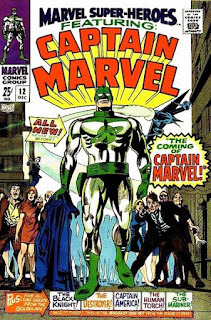 Find out why Captain Marvel is wearing green. Academy-award winning actress Brie Larson plays the superhero, Carol Danvers / Captain Marvel. She has a solo film coming in 2019. Captain Marvel will be the Marvel Cinematic Universe's first female-led movie about a superhero who has powers thanks to an alien race known as The Kree empire. But Brie Larson first appears in Avengers 4. The behind-the-scenes photos of the 28-year-old Oscar winner ("Room") were reportedly shot on the Atlanta set. Captain Marvel will be the Marvel Cinematic Universe's first female-led movie about a superhero who has powers thanks to an alien race known as The Kree empire. The upcoming Captain Marvel film is set in the 1990s. So this costume might not be the same. Some costume concept art looks very similar to the comic book costume. 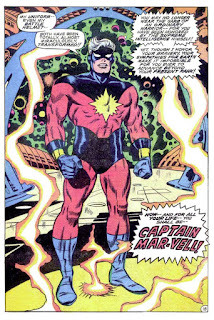 For reference: here's what Captain Marvel's comic book costume looks like. 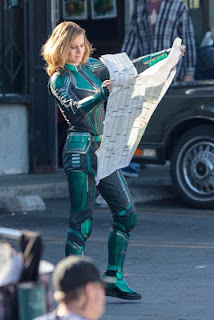 So people started wondering what's with the green costume? Is she going to be a play a leprechaun? While we don't know for sure I'm going to try and break down reasons why the costume could be green and why it's awesome. 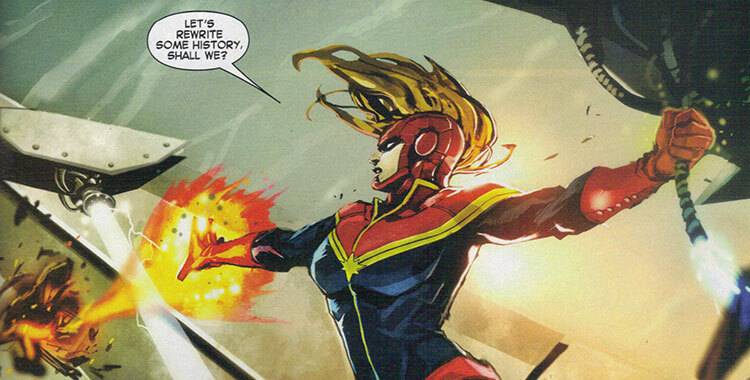 The first superhero to take on the name Captain Marvel is not Carol Danvers. 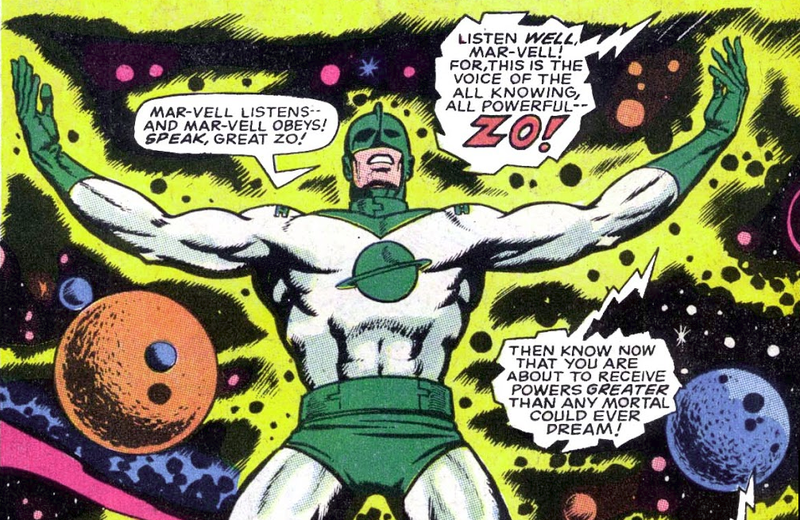 It’s a Kree warrior named “Mar-Vell”. 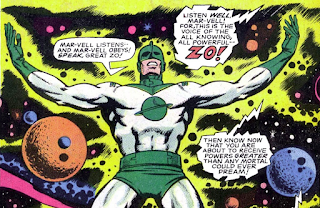 Stan Lee and Gene Colan created him for Marvel Super-Heroes #12 in1967. 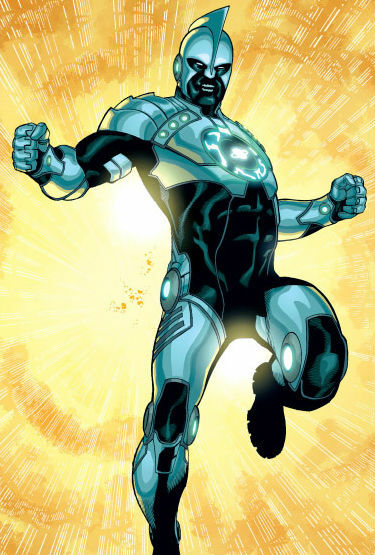 Mar-Vell was a Kree spy that decided to become a superhero. Why does this bit of comic book trivia matter? Because Captain Marvel wore a silver costume with a green helmet and trim. Later on, he gets a new costume and powers that have the familiar red-blue-and-gold color scheme. But maybe Danvers wears Mar-Vel’s first costume. 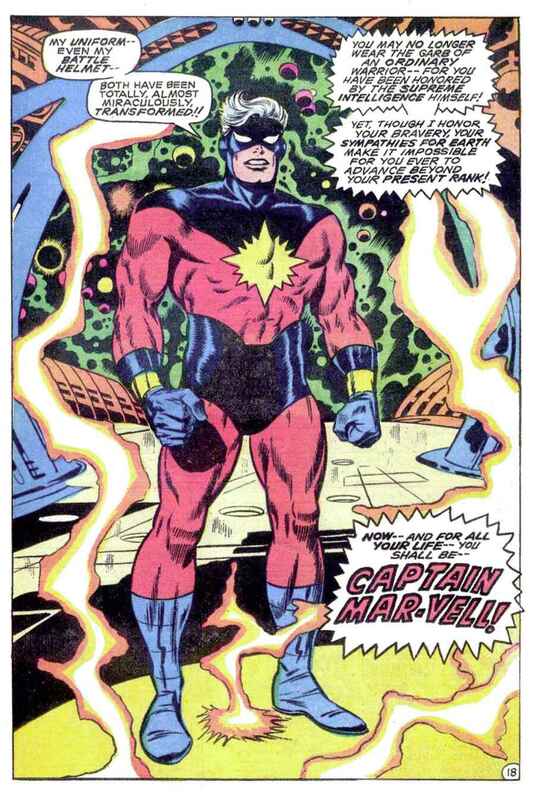 We know Jude Law plays Mar-Vell in the upcoming solo Captain Marvel movie. It’s possible this is his uniform and she wears it. Although it’s hard to imagine a costume for 6' 0" (1.83m) Jude Law fitting 5' 7" (1.70m) Brie Larson. But, you know, comic books. Another possibility is this isn’t the costume color scheme at all. This is a behind-the-scenes photo and might be very different from special effects. Concept art of her costume shows her with a costume very similar to this but with the familiar color scheme. The costume details might be rendered using CGI. The green sections would be replaced by a digital recreation. A few of Marvel characters are like this. For example, in Guardians of the Galaxy Rocket Racoon was actually played by director James Gunn‘s brother Sean Gunn. He wore a green screen suit for reference. “Sean Gunn is not a stand-in," James Gunn explained on Facebook Live "He is a motion reference actor. That means we film everything Sean does on set as Rocket. We film it. I don’t stop doing takes of him until we get the performance right and then we use that performance as a basis for much of Rocket’s acting. And he does a fantastic job in that role. He knows it. He understands it." When Mark Ruffalo is on-set as Hulk he wears a hilariously goofy green foam appliance and it’s replaced with CGI. The entire costume for Ryan Reynolds’ Green Lantern was rendered using computers. 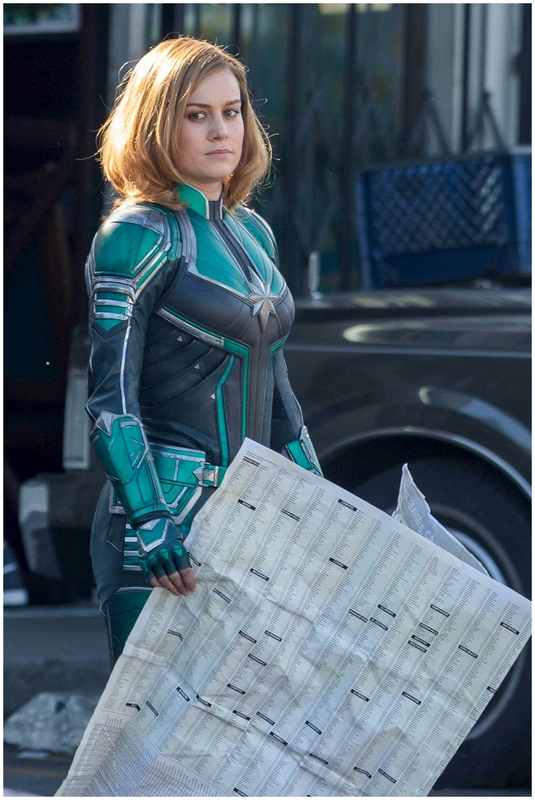 It’s possible that they used a green suit on set to give post-production something to work with when they render the costume. It ain't easy being green. Another similar idea is that only parts of the costume show up as CGI. Captain Marvel is going to have some serious superpowers. 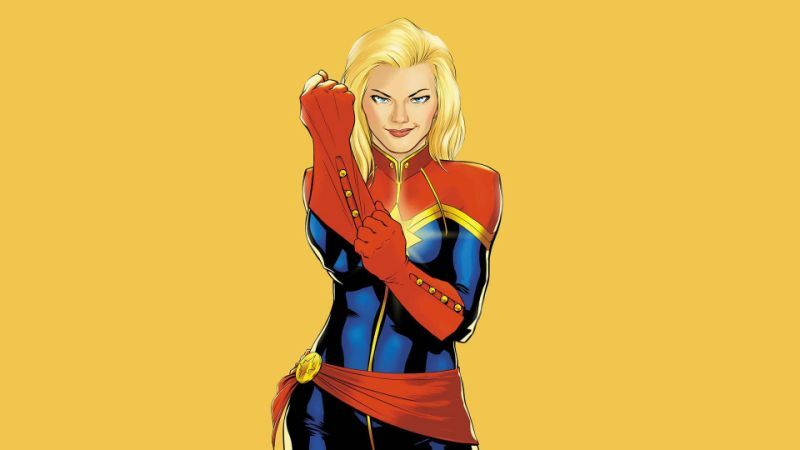 In the comics, some of Captain Marvel’s superpowers include Superhuman strength, speed, stamina, durability, energy projection and absorption and Flight. So maybe the costume has sections that have a glow or do other energy tricks. That would explain why the sections with the brightest green are shown as red in the concept art. One nice touch is Captain Marvel will be the first female superhero that doesn't wear insanely impractical high heels. If the MCU version is similar Brie Larson may wear a Kree uniform. 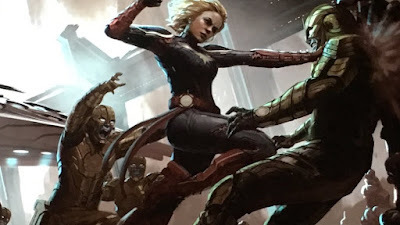 In the comics, Carol Danvers is kidnapped by a Kree Colonel and used as bait to trap Captain Marvel. Carol and Mar-Vell get caught in a Kree weapon explosion and it fuses her genes with alien Kree genes. Kind of like an Oreo sandwich of superpowers. She calls herself Ms. Marvel and becomes a superhero in a black and gold costume. After Mar-Vell dies she changes her name and costume to Captain Marvel in honor of the fallen superhero. She might have taken (or stolen) a Kree suit when she escapes from the ship and wears it as a costume. 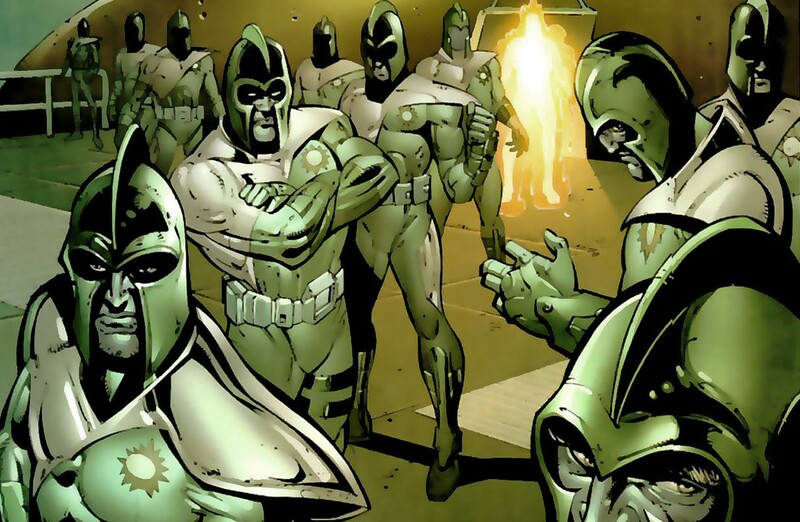 The Kree have shown up on Agents of S.H.I.E.L.D. and Guardians of the Galaxy but they don’t wear anything like what she’s has. Still, it’s a possibility since the color most closely associated with the comic book Kree is green. While the concept art showed a comic book accurate version of the costume it’s just a concept. 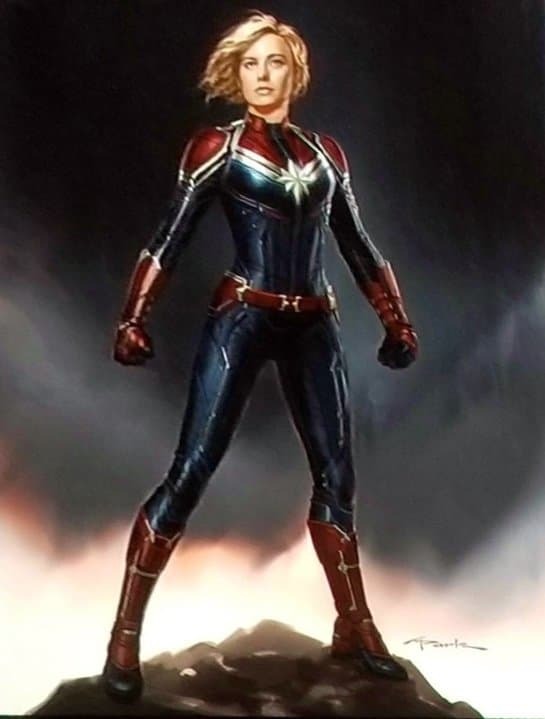 The final costume color might be modeled after the Ultimate version of Captain Marvel. In the alternate Marvel universe known as Ultimate, a Kree warrior named Mahr-Vehl wears a green suit. 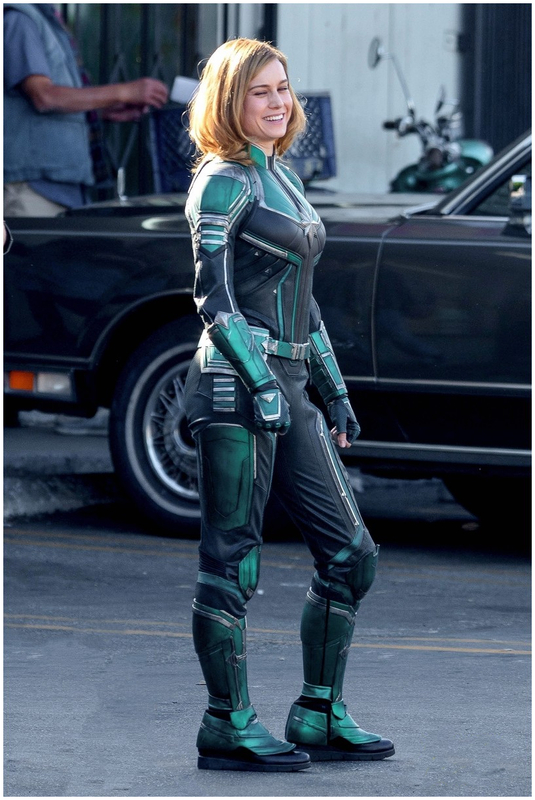 It’s a green and white cybernetic battle suit that gives Captain Marvel superpowers like increased strength, increased healing, speed, flight and the ability to create energy shields or blasts. This wouldn’t be the first Marvel character based on the Ultimate universe. While Nick Fury was traditionally an old white guy the Ultimate version was a black guy. When Marvel Studios started casting they nabbed Samuel L. Jackson to play him. This could be another shout-out to the Ultimate universe. Another possibility is that she changes her costume colors after meeting Captain America. In the comics, Carol Danvers has a lifelong love of aircrafts and flying so she enters the Air Force after high school. She's a top student at the Air Force and because of her natural combat skills and intellect, she goes into intelligence. Later she becomes the youngest security captain in NASA's history. Since Danvers is ex-military it would make sense that she'd a huge fan of the greatest soldier of them all: Captain America. After working with him fighting Thanos in Infinity War she may decide to change her costume colors to match his red-white-and-blue costume throwing in some yellow for good measure. 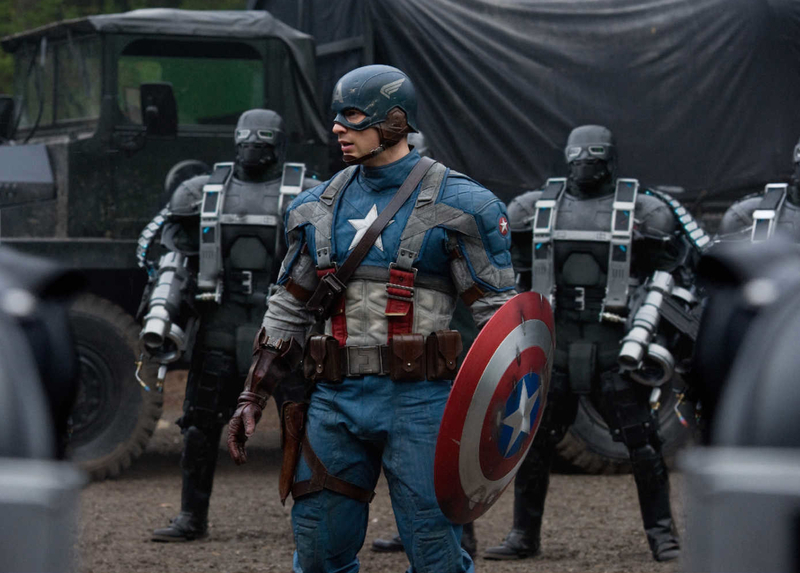 The costume already borrows heavily from Captain America's armored technical look and she may borrow his colors too. What do you think of the costume? Why do you think it's green?